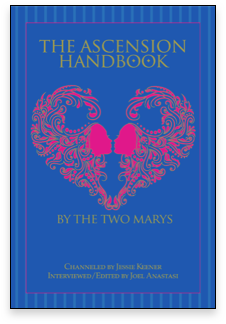 The Ascension Handbook was drawn from discussions between Joel Anastasi and the Two Marys, the entwined energies of Mary, the mother of Jesus andMary Magdalene, his spouse, channeled by Jessie Keener. The Handbook is designed to help mankind fully realize itself as God. This is called the Ascension Process–ascending from a limited awareness of what it means to be alive as a human and expanding that into the understanding that we, indeed, are God. Subtitle: A Guide to Your Ecstatic Union With God.